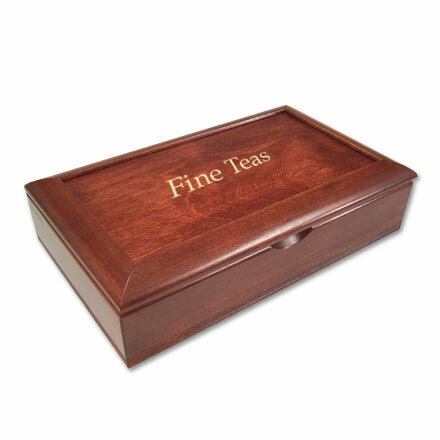 Fine Tea Box | Custom wood specialities. Made in the USA. How does a tea company sell the relaxing, good-all-over feeling one gets from a cup of tea? For this tea company (generic name/logo added per request), it's a point-of-purchase wood box handcrafted by Pocumtuck. 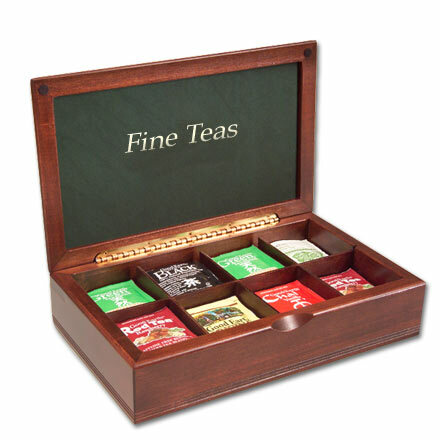 This Poplar box with a cherry finish features scalloped recesses for clever, easy opening, sectional compartments for tea flavor choices and a logo imprint on both the box exterior and interior for gentle but steady branding. Other Pocumtuck options include different box sizes, varying compartment arrangements to accomodate an endless range of products. Made in the USA.